I have met Peter Lever twice, on both occasions in 1972 when I was twelve. I didn’t realise it at the time but it was his benefit season, so it was in his interests to be friendly and approachable. That much conceded I have never doubted that he was anything other than genuine in his dealings with me, which mean that for me he has to be the most pleasant natured fast bowler who has ever lived. My first meeting came at Church Road in Lytham on Friday 23 August 1972. I had gone to watch a Lancashire side playing Lytham. It was pretty much a full Lancashire side, with all the big names playing for the county. I bought a scorecard and my aim for the afternoon was to get all the Lancashire players to sign it. I was a shy 12 year old, and cannot now recall how I managed to pluck up the courage to ask any of these God like human beings to sign my card, let alone all of them. I must have asked Lever early on I suppose, but in any event what I do recall is wandering around the ramshackle pavilion with him as he made sure I got them all. Inevitably Lever couldn’t get me the autographs of the two in the middle straight away, but whilst we were going round the others Harry Pilling was dismissed, and Lever stood and chatted to me whilst Pilling sorted himself out and then got me him as well. At that point he must have been sick to death of my inane babbling about Lancashire players of the past, and he sent me on my way, but he did tell me to come back after Barry Wood was dismissed and he would make sure I got the last one to complete the set. He was as good as his word and, to leave me about six inches taller when I left him, he remembered my name as well. But he didn’t remember it for too long, as I saw Lever the following day. It was quite a week for me as on that Saturday I was one of those present at the second ever ODI, and the first to be played in England. Based on the experience of my subsequent visits to Old Trafford it was fortunate that the weather was fine. Wisden tells me that England won by six wickets with six overs to spare. Dennis Amiss scored a century for England, although the only delivery in the entire match that I recall was one from Geoff Arnold that bowled Aussie opener Graeme Watson for a duck. In those days small boys, and indeed the larger ones too, were allowed to run on to the pitch at the end of the game, and I also vividly recall following the others on at the end, a memory tinged with frustration as, had I had my wits about me I could have pocketed the match ball, but as it was I ran straight past it without thinking. In the lunch interval I had met Lever again. There was no Lancashire game being played so, had I thought about it, it would have been no surprise that Lever was wandering round the crowd, in the company of David Hughes, collecting cash in a bucket. I had had to leave Lytham just before the end of that game, my lift home insisting on a swift departure. The match had been all over bar the shouting but seeing Lever again I piped up with the question “Did you seem them off yesterday Mr Lever?”. Poor old Lever looked totally wrongfooted, but was saved by Hughes, who my father had tipped off as to what may happen, and my self-confidence took another boost as Hughes jumped to his teammate’s rescue by quickly butting in with “Hello again young Martin, yes we won yesterday and I got the last two wickets”. My Dad did eventually tell me about his quick word with ‘Yosser’, but at least he left it a few years before doing so. In those days Lever was one of the top pace bowlers in the country. He never did quite enough to become an automatic choice for England but he played in 17 Tests in the early 1970s and took 41 wickets at 36.80. A right arm pace bowler Lever was one of those whose bowling frequently attracted the adjective ‘slippery’, which seems to be a very unscientific way of saying that from a batsman’s point of view he was quicker than he looked. 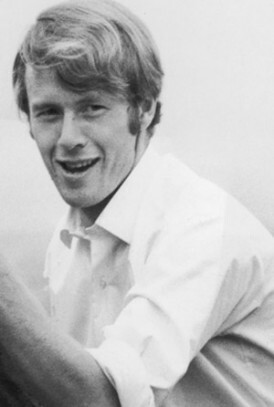 In his early years he had a distinctive curved approach to the wicket, the abandoning of which in Australia in 1970 coincided with his England debut. At the time Lever, and everyone else, believed that he made his Test debut at the Oval in 1970. The planned series for that summer against South Africa had been cancelled. In its place a hastily arranged series of five matches was played under full Test match conditions against a powerful Rest of the World side. The games were billed as Test matches and, briefly, were treated as such. For the final match, which England went into 3-1 down, Lever was called up to replace Tony Greig, who in turn had made his international bow in the second match of the series. The England attack was led at the Oval by John Snow and Chris Old and Lever came on as second change. He removed Eddie Barlow and Mushtaq Mohammad in his first spell and then had to stand back in admiration with everyone else on the ground as Graeme Pollock and Garry Sobers put on 165. Lever returned later to bowl both of them before adding the wickets of Clive Lloyd, Mike Procter and Intikhab Alam to give him 7-83, and arguably the strongest seven-fer ever taken*. According to Wisden his command of perfect length and direction made him a formidable opponent. The true Test debut followed the following winter when Lever was one of Ray Illingworth’s side who became the first England team to win back the Ashes on Australian soil since Douglas Jardine’s success in the Bodyline series almost forty years previously. Lever’s start in Australia was disappointing, but after some cheap wickets in Tasmania following his abandoning his curved approach to the wicket he became a very useful foil to England’s match winner John Snow for the rest of the series. Thirteen wickets in five Tests might sound a disappointing return, but they cost Lever a respectable 33.76 runs each, and he conceded barely three runs per eight ball over. Back in England in 1971 that summer’s visitors were Pakistan and India. Lever failed to impress against the Pakistanis and was dropped for the first match of the India series. He was back for the second however, Snow having been suspended after an incident in which he ran into Sunil Gavaskar and sent the diminutive opener flying as he tried to throw down the stumps after fielding from his own bowling. England batted first and ended the first day rather uncomfortably placed at 217-7. That of itself represented something of a recovery, Lever and skipper Illingworth having already put on 30 for the eighth wicket. Next day was the start of my family holiday, which began with the long drive from Blackpool to Bournemouth. My father had sole control of the car radio and it was Test Match Special all the way to the South Coast. I had expected to be listening to commentary of Lever bowling before too long, but excitement mounted in the back of the car as he and Illingworth batted on and on. They had put on 168 when Illingworth was dismissed, and after that Norman Gifford helped Lever add another 30. Seldom has a man deserved a century so much as Lever did that day but, much to my distress he was left high and dry on 88 when John Price was run out for a duck after facing just three deliveries. It was to remain the highest score of Lever’s First Class career. In 1974/75 Lever made a second trip to Australia. Dennis Lillee and Jeff Thomson made sure it was a distressing experience for England’s batsmen. For Lever the tour was also a huge disappointment and after going wicketless in the first Test he dropped out of contention for the next four and, by the eve of the final Test, had taken just 13 First Class wickets on the tour at 48. Only some modest success in Tasmania kept his average under 60. By the time the sixth Test began both sides’ quicks were in trouble. For the Australians Thomson was out injured and Lillee was to break down after just six overs. Bob Willis was not fit to take his place for England so Lever, by then the forgotten man of the tour, replaced him. Ian Chappell won the toss and was faced with a tricky choice. The weather was hot but high humidity offered the prospect of rewards for accurate swing bowling and, whilst just a shade too short of a length for the quick men, leaky covers had caused a damp patch that would make the ball bump alarmingly. Chappell chose to bat and after a dozen overs doubtless wished that he hadn’t. The formbook had been turned on its head. Australia were 23-4 and Lever had figures of 4-5. Rick McCosker and Ross Edwards had failed to trouble the scorers and Ian Redpath and Greg Chappell had gone with just a single to their names. Chappell had also suffered a crack on the jaw from a Lever lifter for his trouble. In the end Australia limped to 152 all out and Lever picked up a couple more wickets to end up with 6-38. Freed from the threat of the gruesome twosome England’s batsmen relaxed and scored 529 and there were three more victims for Lever in the second innings as the visitors claimed a consolation victory at a canter. After the Ashes series concluded England made their way to New Zealand for a couple of Tests there. In the first of them Lever was involved in the incident which, for most, remains their first thought when his name is mentioned, the near death experience of Ewen Chatfield. England dominated the match and looked like winning it inside four days, but had been held up for the last hour of that fourth day by a dogged last wicket partnership between debutant Chatfield and his captain Geoff Howarth. On the fifth morning the rearguard action continued, Howarth doing all he could to take most of the strike and Chatfield looking comfortable enough when called upon to face the bowling. After 45 minutes Lever dug one in short at Chatfield and a man who on 13 had more than doubled his previous best First Class score, unsurprisingly did not know how to deal with it and popped up what should have been an easy catch close in on the leg side. England’s problem was that there was no short leg. With a dark cloud being blown towards the ground New Zealand now looked like they might save the game after all, and when Howarth miscounted and left Lever with four deliveries at Chatfield in the next over two men were brought in close on the leg side and a bouncer delivered. The ball went from Chatfield’s glove to his head and after a few seconds, in which he looked dazed to say the least, he collapsed. There was no doctor on the ground, nor was any resuscitation equipment immediately to hand and had it not been for the timely intervention of England’s physio, Bernard Thomas, Chatfield would not have survived. Even as it was at one point his heart did stop beating. Lever was distraught and followed Chatfield’s stretcher off the field in tears. He visited his hospital bed twice before the day was out. On the second occasion Chatfield, by then on the road to recovery, maintains Lever looked worse than he felt. Chatfield assured Lever that he was not to blame and no one would have been happier than Lever when Chatfield went on to enjoy a long and successful international career. Just over three months later, starting on 31 May, one of the more remarkable County Championship matches that have been played took place. On a sunny Saturday in the Peak District Lancashire won the toss in their match against Derbyshire and piled up 477-5 in the 100 overs the rules of the championship then permitted them. In the few minutes left Lever removed one of the Derbyshire openers as the home side closed the first day on 25-2. Lancashire, in the manner of the times, had to do a round trip of almost 400 miles on the Sunday to play a Sunday League game in Essex and then, on the Monday, woke up back in Buxton to the remarkable sight of around three inches of snow on the ground. Inevitably there was no play that day but, perhaps surprisingly, the umpires decided that play could begin on time on the last day. On a wicket where good length balls could and often did rise to throat height Derbyshire were all out for 42 and 87. Lever bowled the first over of the day before taking his leave of the attack and whilst he was persuaded to bowl five overs (in which he took 5-16) in the second innings he bowled at barely medium pace. The still raw memory of the Chatfield incident was no doubt at the forefront of his mind. A key member of a Lancashire side that had dominated the early days of limited overs cricket in England, Lever’s inclusion was assured in England’s squad for the first World Cup that begun a couple of weeks after that match at Buxton. He was economical enough but overall losing semi-finalists England failed conspicuously to take advantage of the fact that they had much greater experience of the format than the Australian side that put them out of the competition. At the end of that 1975 season Lever turned 35 but it had proved to be a vintage summer. His 61 First Class wickets at 18.00 represented the best haul of his career and even without those favourable conditions at Buxton that would still have been the case. Only on one other occasion did he average less than 20, and that had been in 1973, so Lever was not a man who lost effectiveness as he got older. After the World Cup he even got a look in for the 1975 Tests against Australia, being selected for the second Test at Lord’s, the first of Tony Greig’s reign as captain. In a much improved England performance he took his last two Test wickets, those of McCosker and Doug Walters, but they weren’t enough to keep him in the side for Headingley where Chris Old, eight years his junior and on home turf, came in. The following summer of 1976 turned out to be Lever’s last as a back problem that was clearly not going to improve finally persuaded him that it was time to hang up his boots. His last match was the Old Trafford Roses match at the end of August. Eight years earlier his illustrious predecessor Statham had taken his leave of the First Class game in the same fixture, and taken 6-34 as Yorkshire were skittled out for 61 in their first innings. For Lever there were just a couple of wickets in defeat, but had it not been possible for Lancashire to sign West Indies paceman Colin Croft for 1977 the county’s seam attack would have looked decidedly threadbare. Lever was sorely missed. Like many before him Lever’s first move after leaving Lancashire was into the leagues, but it wasn’t a life that suited him. An intelligent and articulate man (he would see off the cryptic crossword in the Daily Telegraph most days) Lever decided to start his own sportswear business. In the long term the business failed and for 1983 Lever linked up with his old skipper Jack Bond, then cricket manager at Old Trafford, and joined the coaching staff. Bond registered him as a player as well, and during one injury crisis the 43 year old found himself back in the first team for a Nat West Trophy game against Somerset. Lancashire lost, and the winning runs were hit from Lever’s bowling. He had not taken a wicket, but figures of 7.5-2-17-0 clearly showed he could still do the job, although the struggle he had getting out of bed the following morning convinced him not to do so again. Unfortunately the combination of Bond and Lever did not bring success to the Red Rose and at the end of the 1987 season both were dismissed. It was also the end of the road for skipper Clive Lloyd and the autocratic chairman who sacked all three did not last much longer. Lever decided to leave cricket, and took up the post of commercial manager at Rochdale Rugby Union Club. The club had not employed anyone in the role before and Lever made a great success of it, boosting the club’s revenues substantially. Eventually in 1993 he decided to go it alone again, and left Rochdale to set up a consultancy service to enable him to make his skills available to a range of clubs. In May 1995 Lever took some time out from his business when he was appointed England’s bowling coach by Ray Illingworth. He resigned just over a year later having gained little pleasure from the job. A winter in South Africa had been particularly disappointing, notably a very public issue with Devon Malcolm, who at one press conference Lever described as a ‘cricketing nonentity’. It is perhaps unsurprising after that that Lever preferred to return to his consultancy, although that did not stop him, when asked by his old teammate and by then Lancashire Chairman Jack Simmons, from helping out with coaching once again at Lancashire from 1998. In 2004 Lever started to look forward to retirement. He would be 65 on 17 September 2005, the age at which he believed he would be able to draw his pension. He had contributed to a scheme at Lancashire for 16 years between 1961 and 1977, as had the club. In the course of the strange dispute that followed an actuary instructed by Lever calculated that his pension pot should have been worth around half a million pounds, enough to provide him with a retirement income of around £22,000 a year. When Lever contacted Lancashire to sort out the details of his pension he was met with a blank response. Nothing could be found in the Club’s archives and months and years of investigation established only that a couple of small policies, initiated during Lever’s time as coach between 1983 and 1986, could be traced. In respect of those policies enquiries produced the response that in 1986, so almost twenty years before, the policies had been cancelled and the premiums returned to Lancashire from whence the club said they had been passed to Lever. The man himself had no recollection of receiving anything at the time. That was hardly surprising in view of the passage of time. The sums involved were just over £1,000 in each case. Of the main fund nothing was found. Around £25,000 in legal costs later Lever took the matter to the Pensions Ombudsman who produced a decision that was most certainly not to his liking. Ultimately the decision was that because the subject matter of the claim arose so many years previously any claim in the courts would be time-barred, and that accordingly the Ombudsman’s hands were tied as well. The Ombudsman’s judgment on the time bar is understandable, although the absence of any paperwork in respect of a scheme it seems it was accepted on all sides existed in some shape or form is a little worrying . A major factor in the decision was that, as a professional sportsman, Lever was entitled to draw his pension as early as age 40, and thus could have made enquiries a quarter of a century before he did. Lever maintained he had not been told that. As his plans never involved retiring at such an early age it is easy to see why he wouldn’t have given the possibility any thought. It is rather trickier to understand why the evidence seems to have been restricted only to Lever’s situation. One of a number of professionals at the club through the 1960s and 1970s anyone taking an interest in what must have been a matter of huge importance to club and player, cannot help but wonder what, in those days before the pensions industry became as heavily regulated as it is now, happened to the pensions of Lever’s teammates. I do know that at the time there was a good deal of sympathy for Lever amongst Lancashire members and the wider community and there was certainly one concerted campaign in the local press to secure some recompense. As a lifelong supporter of both Lancashire County Cricket Club and Peter Lever I do hope that perhaps some sort of settlement was finally cobbled together and that the reason there has been no outpouring of angst from Lever, now living in retirement in Devon, is that fairness has played a hand in his situation, rather than simply because he is a genuinely nice bloke. *Fortunately for me I was able to run this particular idea past Dave Wilson, co-author with Patrick Ferriday of Supreme Bowling and, more pertinently for these purposes, the man who crunched all the numbers for the book. Based on the methods used the best seven-fer in Tests in terms of quality of victims was Harbhajan Singh’s for India against Australia at Eden Gardens in 2001. Had, however, the 1970 series retained its Test status Dave confirms that Harbhajan’s performance would be second to Lever’s.